Shri Badrinath Dham is one of the four holiest places in Hindu Religion and as per legends, we have visit it once in lifetime. This is the temple of Lord Vishnu and every year many devotees worship here. The temple opens during summer season and closed during winter because of heavy snow falls during winter. Badrinath is well connected with roads transport and you can easily visit the temple, its not too far from main road. for Stay Hotel, Dharmashala, Lodge and Cottages are available in Badrinath Dham and for food you will get North Indian food any where available in the Dham. you can start your trip to Shri Badrinath Dham from Haridwar/ Rishikesh. From Haridwar the Badrinath Dham is approx 326 Km which takes around 10-12 Hrs by road. So you need a day to reach there means you have to wake up at morning 6:00 am if you are visiting Shri Badrinath Dham, or you can stay in route like in Pipalkoti or Joshimath for over Night stay and next day move to Badrinath Dham. The total trip will take around 3+4 Days for Badrinath Dham. Here's the tour plan or itinerary. Day 1: Reach to Joshimath from Haridwar and Stay there for Overnight. Day 2: Joshimath to Badrinath which is approx 36 KM, around 2 Hours journey and you can do sightseeing in Badrinath on same day. Visit Evening Aarti (Prayer) at Badrinath. Day 3: You can visit the Nearby places of Badrinath like Mana Village the last Village of India near border of China and Vashudhara Falls and many more spots. Day 4: You can wake up at early morning and leave to Haridwar/ Rishikesh. The total trip will take upto 4 Days and you comfortably visit Shri Badrinath Dham in 4 Days with your family. The Badrinath Dham Temple Opening Date is not confirmed yet, but the tentative date will be around 5th May 2019. 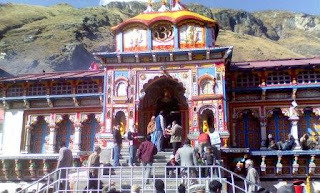 If you want take a good transportation option or Hotels in Joshimath or Badrinath, you can just mail us at onlineuttarakhand@gmail.com we will happy to make you a best trip.